For Summer Session 2016, we hit the streets and began polling students (online and in-person) on various aspects of campus life. 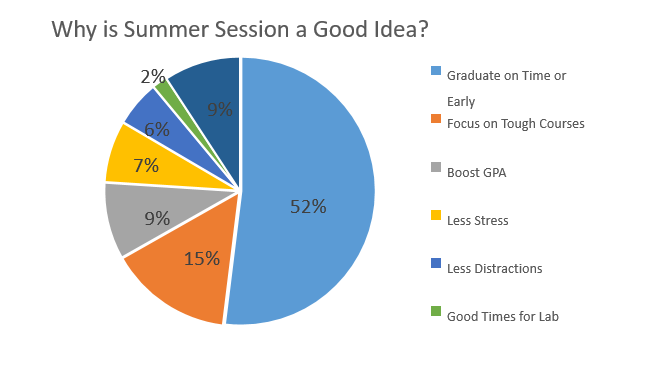 Our first question: “Why is it a good idea to take courses during Summer Session?” We received numerous great responses, but with nearly 52% of the votes, the #1 reason why students believe it’s a good idea to take a Summer Session course is (Drum roll, please)…… To Graduate on Time or Early! Summer Session is a great opportunity to catch up or get ahead. Check out the amazing classes we have to offer (including a number of hybrid, online, GEP, and evening courses) and be sure to participate in our next poll on our Summer Session myUMBC page or at our table on Commons Main Street. Come on over and say hi!